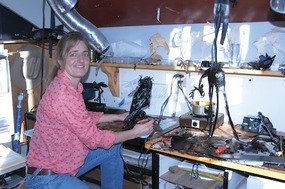 Lance Whitner in her studio. The landscape inside an artist’s studio can be an inspirational key to deciphering the work that emerges. Creative spaces evolve out of barns, garages and bedrooms – each space feeds into the artistic process and takes on a taste of the individual who toils there. In their own words, five local artists reveal what’s most endearing about their studios. About three and a half years ago, shortly after graduating from Colorado College with a biology degree, I returned to Steamboat to care-take the log home my mom and stepdad had purchased a couple years previously. The first owners were artists, and they included a studio space above the garage that opens to expansive views of Mount Werner and the city. It’s difficult to imagine a better studio design and location. The room is full of natural light; is equipped with a sink, countertops and many light fixtures and electrical outlets. It even boasts a long trap door for use in moving oversized canvases between the studio and the garage below. I paint and sleep in this single room, surrounded by the rustle of aspen leaves in summer and the muted calm of snow in winter. The house itself is tastefully designed and furnished in a manner one might call “vintage-European-Western.” My current still-life work often features one or more of the items found throughout the house, sometimes arranged before a studio window to use the ever-changing landscape of the Yampa Valley as a backdrop. 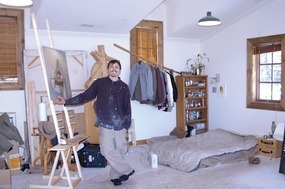 My studio is in and above my garage and has vaulted ceilings with great light. My husband, Matt, and I designed it to accommodate even monumental size sculpture. One of my favorite parts is the “door into space.” It is a French door that can be used to lower large pieces from the upstairs to the alley below. My space is quite technical in nature due to the materials that I use. I need heat, vents, electricity, torches, chemicals, grinders and all sorts of cool stuff. That being said, I guess I love having all of the right tools to do my job, so I love that my space has all of those things. I have a red plywood floor that I love. The color keeps the space feeling warm all the time and I never have to worry about getting clay and wax ground into it because it is a studio and SUPPOSED to feel “worked in.” We also have family space in my studio, which is a pro and a con. Sometimes it’s distracting when the laundry, dishes, computer and clay are equidistant from my coffee mug. Luckily, I have my books, maquettes and sketchbooks around to draw me back to my sculpting space. Within the next year we plan to take this space a step further and make it into a place where art lovers can come, share a bowl of soup with me, and experience the process for themselves. My creative space is my home studio. It’s a large, sunny, warm room with a balcony off the south side, so that I can paint inside or outside. I love the view of the meadow with mountains in the background from my studio balcony. I can see one of my favorite hiking spots up Silver Creek Trail to a rock outcropping where I hike to clear my mind or resolve a creative block. My studio is filled with piles of creative magazines, art books and clippings that I have saved for inspiration and collage. It has big comfy chairs for dreaming up my next project. It holds all my supplies for collage, painting and creating in one location. Sitting on my patio in the woods inspires me to create. I pretty much have the dream studio. If I think I need more room for storage and working, the reality is that I just need to be satisfied and more organized. The only other thing I sorely need is a cleaning, organizing and marketing fairy…and a remote tool finder, for when I misplace a tool or brush under the layers of stuff I’m working on. 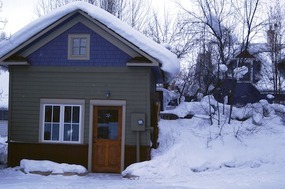 My house is 100 years old and my studio is an old barn-carriage house-garage in the backyard. When we bought the house the structure had rotten wood in the walls and a severe lean from years of snow piling up on one side. We pulled off the inside walls, repaired the rot, insulated, left and supported the lean, and returned some of the original interior siding – a beautiful silver wood paneling. 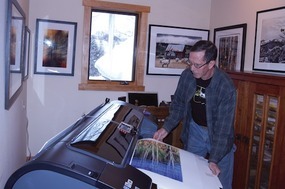 Now it’s a studio that I share with my husband, photographer David Patterson. What I love most about my studio is that it’s 20 steps from my house, so my coffee stays warm for the commute. What inspires me most about my studio is that it’s my workspace. I get to leave my other roles and responsibilities in the house and come out here and just paint. Lance Whitner is never more at home than in her studio. My dream studio design is to have a space large enough to include a sofa and table for friends and kids to hang out at while I’m working. And more wall space to be able to work on more paintings at the same time…and still be at home. My creative space would be described as, “Dad, what happened to our bedrooms! ?” Beds have been replaced by computers, scanners, printers, easels, matte cutters, framing tools, books, canvas and more. No wall should be without an image or painting. Creativity may be in a room where there is silence or listening to the sounds of Big Band music. My “studio” is pure enjoyment. I might leave my computer, go to the kitchen for a cup of coffee and be surprised by what is just outside our windows to capture with my camera. My inspiration comes from viewing multiple images and keeping a notebook for current and future projects. I may initially print several images and clip them up to view. This becomes my inspiration for a pure photograph, an artistic interpretation of a photograph or mixed media presentation. I rely on myself to be the sole hands-on artist, using my eyes and hands from start to finish for each of my works. I need to thoroughly understand the processes, from shutter click to gallery presentation. I can then be more creative and judgmental, making changes anywhere along the creative journey.